Auto racing began in the mid-19th century, and the sport has grown in popularity ever since. The first prearranged match race of two self-powered road vehicles over a prescribed route occurred at 4:30 A.M. on August 30, 1867, between Ashton-under-Lyne and Old Trafford, a distance of eight miles. It was won by the carriage of Isaac Watt Boulton, one of six he said he had run over the years, perhaps driven by his 22-year-old son, James W. The race was against Daniel Adamson's carriage, likely the one made for Mr. Schmidt and perhaps driven by Schmidt. The reports do not indicate who was driving, since both were violating the red-flag law then fully in force. Boulton's carriage was developed from a scrapped John Bridge Adams light-rail vehicle. These were solid fired steam carriages. This event and the details of the vehicles are recorded in the contemporary press, The Engineer, and in Fletcher's books. The Wisconsin legislature passed an act in 1875 offering a substantial purse for the first US motor race, which was run on July 16, 1878, over a 200-mile course from Green Bay to Appleton, Oshkosh, Waupon, Watertown, Fort Atkinson and Janesville, then turning north and ending in Madison. Only two actually competed: the Oshkosh and the Green Bay (the machines were referred to by their town of origin). This is examined and illustrated in detail in The Great Race of 1878 by Richard Backus, Farm Collector, May/June 2004. Internal combustion auto racing events began soon after the construction of the first successful gasoline-fueled automobiles. The first organized contest was on April 28, 1887, by the chief editor of Paris publication Le Vélocipède, Monsieur Fossier. It ran 2 kilometres (1.2 mi) from Neuilly Bridge to the Bois de Boulogne. 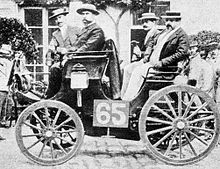 It was won by Georges Bouton of the De Dion-Bouton Company in a car he had constructed with Albert, the Comte de Dion, but as he was the only competitor to show up, it is rather difficult to call it a race. Sixty-nine cars started the 50 km (31 mi) selection event that would show which entrants would be allowed to start the main event, the 127 km (79 mi) race from Paris to Rouen. The entrants ranged from serious manufacturers like Peugeot, Panhard, or De Dion to amateur owners; only 25 were selected for the main race. The first American automobile race is generally held to be the Thanksgiving Day Chicago Times-Herald race of November 28, 1895. Press coverage of the event first aroused significant American interest in the automobile. The 54.36-mile (87.48 km) course ran from the south side of the city, north along the lakefront to Evanston, Illinois, and back again. Frank Duryea won the race in 7 hours and 53 minutes, beating the other five entrants. The very successful early European rally races ended in 1903, when Marcel Renault was involved in a fatal crash near Angoulême in the Paris–Madrid race. Nine fatalities caused the French government to stop the race in Bordeaux and ban open-road racing. The Milwaukee Mile is the second-oldest motor racing track in the world still in existence, with racing being held there since 1903. It was not purposely built for motor racing, however. It started as a one-mile (1.6 km) horse-racing track in the 19th century. The first closed-circuit automobile race was held on September 7, 1896 at the Narragansett Trotting Park in Cranston, Rhode Island, and was won by an electric car built by the Riker Electric Vehicle Company. 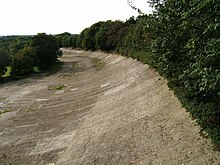 Brooklands, in Surrey, was the first purpose-built motor racing venue, opening in June 1907. It featured a 4.43 km (2.75 mi) concrete track with high-speed banked corners. Brooklands was also a centre of the aviation industry, with Vickers setting up a factory and aerodrome there during World War I. The racing circuit was closed in 1939 as war-time aircraft production took over. Damage done to the track during World War II meant the track never reopened for racing. Competition gradually spread to other parts of the British Empire. The first competition in India was held in 1905 by the Motor Union of Western India. It ran from Delhi to Mumbai, (Delhi–Bombay trials 1905) a distance of 810 miles (1,300 km), in an attempt to expose India to the automobile and test its suitability for Indian conditions. Lord Curzon, the Viceroy, gave his consent to the event. One of the oldest existing purpose-built automobile racing circuits in the United States, still in use, is the 2.5-mile (4.02 km)-long Indianapolis Motor Speedway in Speedway, Indiana, built from March to August 1909, when it first opened for racing. It is the largest capacity sports venue of any variety worldwide, with a top capacity of some 257,000+ seated spectators. The oldest asphalt-paved oval track in the United States is Thompson Speedway Motorsports Park in Thompson, Connecticut, once known as the "Indianapolis of the East." The 1930s saw the transformation from high-priced road cars into pure racers, with Alfa Romeo, Auto Union, Bugatti, Delage, Delahaye, and Mercedes-Benz constructing streamlined vehicles with engines producing up to 450 kW (603 hp), aided by multiple-stage supercharging. From 1928 to 1930 and again in 1934–1936, the maximum weight permitted was 750 kg (1,653 lb), a rule diametrically opposed to current racing regulations. Extensive use of aluminum alloys was required to achieve light weight, and in the case of the Mercedes, the paint was removed to satisfy the weight limitation, producing the famous Silver Arrows. NASCAR was founded by Bill France, Sr. on February 21, 1948, with the help of several other drivers of the time. The first NASCAR "Strictly Stock" race ever was held on June 19, 1949, at Daytona Beach, Florida. The Strictly Stock division was put on hold as American automobile manufacturers were unable to produce family sedans quickly enough to keep up with post-World War II demand. In Europe, the FIA adopted the ACO GTP rules virtually unchanged and sanctioned the Group C World Endurance Championship (or World Sportscar Championship), featuring high-tech closed-cockpit prototypes. In the USA, the IMSA Camel GTP series boasted close competition between huge fields of manufacturer-backed teams and privateer squads – the cars were technically similar to Group Cs but used a sliding scale of weights and engine capacities to try to limit performance. The FIA attempted to make Group C into a virtual "two seater Grand Prix" format in the early 1990s, with engine rules in common with F1, short race distances, and a schedule dovetailing with that of the F1 rounds. The IMSA GT Championship had been prototype-based since 1983, with less emphasis on production cars. Australian Production Car Championship was first contested in 1987, with the inaugural champion determined from the results of two races held at the Winton Motor Raceway in Victoria on September 27. The first World Touring Car Championship, which was open to Group A Touring Cars, was held in 1987 concurrent to the long-running European Touring Car Championship (ETCC). Additional rounds were held outside Europe at Bathurst in Australia, Calder Park Raceway in Australia (using both the road course and the then-newly constructed Thunderdome), Wellington in New Zealand and Mount Fuji in Japan. The Drivers Championship was won by Roberto Ravaglia in a BMW M3, and the Entrants Championship was won by the Eggenberger Motorsport Ford No 7 entry, which was a Ford Sierra. Winston Cup Series underwent a large boom in popularity in the 1990s. This coincided with a decline of popularity in American Championship Car Racing. The FISA decided to separate the rally cars into three classes: Group N (production cars), Group A (modified production cars), and Group B (modified sport cars). Group B was introduced by the FIA in 1982 as a replacement for both Group 4 (modified grand touring) and Group 5 (touring prototype) cars. The IMSA GT Series evolved into the American Le Mans Series, which ran its first season in 1999. The European races eventually became the closely related Le Mans Series, both of which mix prototypes and GTs. The SCCA World Challenge consists of a one-hour race for each round, combining three classes: GT (Chevrolet Corvette, Aston Martin DB9, etc. ), "GTS" (Acura TSX, BMW 3 Series, etc. ; replaced the former touring car class), and Touring Car (a "showroom stock" class similar to Grand Am's Continental Challenge). NASCAR was becoming increasingly dominant, and the IndyCar Series' split from CART in 1996 put more emphasis on ovals regarding domestic open-wheel racing. ^ "THE GREAT RACE OF 1878". Retrieved 2016-07-27. ^ History Channel. "Electric car wins the first auto race in the United States". History. Retrieved July 3, 2018. ^ "The Federation of Motor Sports Clubs of India". Fmsci.in. Archived from the original on July 21, 2011. Retrieved 2011-08-08.